We've had a cloth advent calendar for Christmas for the past 20 years. Since the kids were little, the same advent calendar sees our family room annually. The nice thing about a cloth calendar with pockets is you can put treats inside for each of the 24 days. 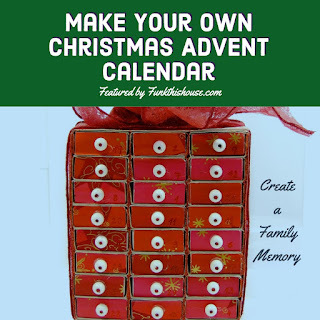 Our family Advent Calendar is featured below. Bring out your own Advent Calendar each year and make it standard part of family traditions. However, if you're not into a store bought reusable Advent Calendar, you can make your own. Get the kids involved. Use 24 kiddie Christmas socks. Glue each sock to a painted cardboard or wooden backboard. Put treats in each sock for each day. Use 24 small boxes (ring size) glued to cardboard or backboard. Keep the lids on the boxes, and inside each box put treats. Decorate the boxes individually. Attach 24 small gift bags to a backboard or cardboard. Put treats in the gift bags. Use mini tree stockings. Put them all together on a piece of string with numbers on the front for each day. Put treats in each one. Use 24 empty toilet paper rolls. I know, that's weird right, but it works. Glue the rolls together in the shape of a Christmas Tree - 1 on the top for the star then, 2, 3, 4, 5, 6, then 2 and 2 for the base of the tree. Glue them together then decorate each one. Place goodies inside each roll. Making your own Advent Calendar is a beautiful reminder during the kids growing years. When they're older, and no longer decorating with you, you'll pull out that calendar along with your past Christmas memories. Time holds our treasures, and our treasures stop time. Think about the decorations your kids have made over the years, and what they mean to you. There isn't anything quite as precious. Whether you use a pre-made Christmas Calendar or DIY one makes no difference. Create memories during the little years to carry you through the big years. When the time is right, take all the decorations your kids have made, wrap them up and pass them on. They can include them into their Christmas traditions along with your family stories. An Advent Calendar is always a special part of December and a fun way for kids to lead up to Christmas. The one we used for some 20 years was handmade by my college roommate when my first son was born. It was made of felt and had ties to tie on hard candies. My 3 kids had such fun every December getting to have their 'treat' each evening and counting the days left until Christmas. Speaking of 'passing on' handmade ornaments, etc. to the 'kids', we did that. My daughter was born one week before Christmas and for her first 10 birthday her Godmother gave her a special ornament. These ornaments became a special part of our Christmas Tree decorations for many, many years. When she grew up and got married, I passed them on to her for her own home decorations. Her two brothers also received special ornaments and these were given to them as adults, along with the ones that they each handmade over the years. By the time I gave away all their unique ornaments, our tree was bare and we had to get new ones that were special to us, the parents. :) Loved your ideas for Advent Calendars, Barbara. Pat, that's awesome that you passed along the family decorations to the kids. I'll be doing that as well in the coming years. Very cool that you made your own advent calendar and used it yearly as well. So nice. Barbara, your advent calendar is beautiful! Putting it out every year and adding a little treat for each day is a lovely tradition. 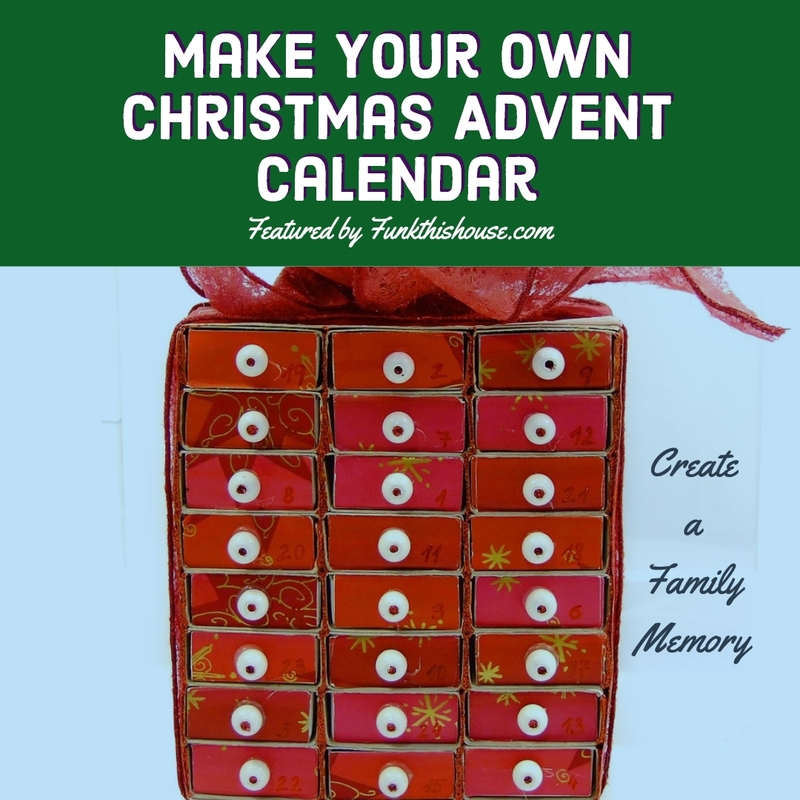 Your suggestions for making a family advent calendar are fabulous. I don't know why I've never considered using wood as the foundation. Truly a most excellent idea! Love this idea Barbara. We have Advent Calendars every year and look forward to filling every little box with treats. I gave them away to one of the kids when we moved. I think I will make one for my other half, he's just a big kid anyways because I miss the joy of a little treat everyday. He'd get a kick out of it too! Memories for sure. Those little treats everyday can be so fun, a nice tradition.